In 2009, Luke Air Force Base initiated a plan to build a 107-acre solar-power-array that would provide about 50 percent of the base’s power needs. The location of the solar-power-array on Luke Air Force Base contained several previously recorded archaeological sites. In 2010, Statistical Research, Inc. began testing and data recovery for the Luke Solar Project. The largest archaeological site excavated during this project became known as Falcon Landing. 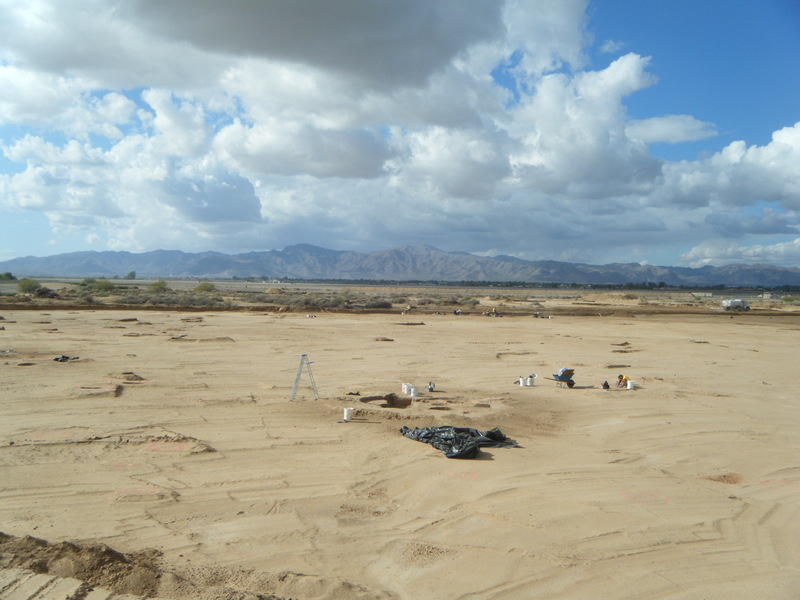 Excavations at Falcon Landing continued through April 2013, uncovering one of the largest Archaic sites known in southern Arizona. Falcon Landing includes over 3,000 features, including thermal pits, house-in-pit structures, fire-cracked rock concentrations, and activity areas. The intensive Archaic occupation of Falcon Landing began around 3300 B.C. and was focused on a nearby seasonal marsh, or mesquite bosque. Archaic people visited this area during the summer months to gather and process mesquite and other wild seed-bearing plants. The mesquite processing techniques, and the accompanying ground stone technology, were established at the beginning of the Middle Archaic period and persisted relatively unchanged until the late prehistoric or early historic period. Although the intensity of occupation at Falcon Landing significantly declined beginning with the Hohokam pre-Classic period, the technology and methods for processing mesquite persisted over 5,000 years. In fact, ethnographic accounts have shown that the mesquite-processing technology identified at Falcon Landing as early as about 3300 B.C. continued to be used by contemporary Native American groups, such as the Piman and Yuman-speaking people of southern Arizona, southern California, and northwestern Mexico.